It is believed that Sake brewing began in the 3rd century B.C., when a method of rice planting was introduced to Japan. The Japanese Liquor Law defines Sake as, "made from rice, rice koji and water using fermentation and filtration processes". Premium sake is split into a number of different categories based on ingredients, which brewing process is used, and other characteristics. However, simply because a sake falls into a certain category doesn't mean that it will necessarily taste like other sakes in that category. The most important factor is the skill of the brewer, which is unique to the brand and brewery. It is ideal to use only the inner core of the rice grains, which allows for the creation of a purer sake. Polishing down the grain increases the amount of raw rice needed for production, and requires extra time and energy. Because of this, a low polishing ratio (how much of the rice is left after grinding off the outside part) often indicates a quality sake. Sakes present a whole range of flavors and fragrances, but the predominant flavor profile of super premium sake can be expressed in terms of sweetness and dryness. Junmai-Sake, Junmai-Ginjo, and Junmai-Daiginjo are often drier, while harmonizing the natural sweetness of the fermented sugars and acids. 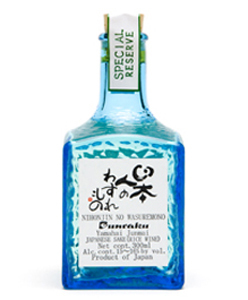 Brewed using specially developed “Akita Sake Komachi” and “Komachi yeast”. Leaving a flowery impression of violets and hints of melon and cherry, to smooth and gently sweet taste. Pairs well with lobster, but can also stand up to rich foods. Brewed with “Hyago Yumenishi” and natural spring water in low temperatures. Mild taste. 100% organic Yamada-Nishiki rice, grown in rice paddies where carps breed. Full-bodied, with a rich aroma. 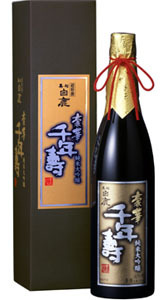 Limited edition long-term aged sake brewed in 1992. Made by carefully aging at a low temperature. Beautiful amber-golden color. Soft, rich aroma with a persuasive personality. Elegant aroma of citrus fruits. Perfectly harmonized with delicate, crisp umami, and hints of mushroom flavor. Rich, smooth and mild aroma. 100% Yamada-Nishiki rice. Brewed with natural, mountain water and organic rice. Fruity aroma, and smooth, gentle body.